On our trip from Austria to Italy, our destination was Bolzano where we were going to spend the next four days. 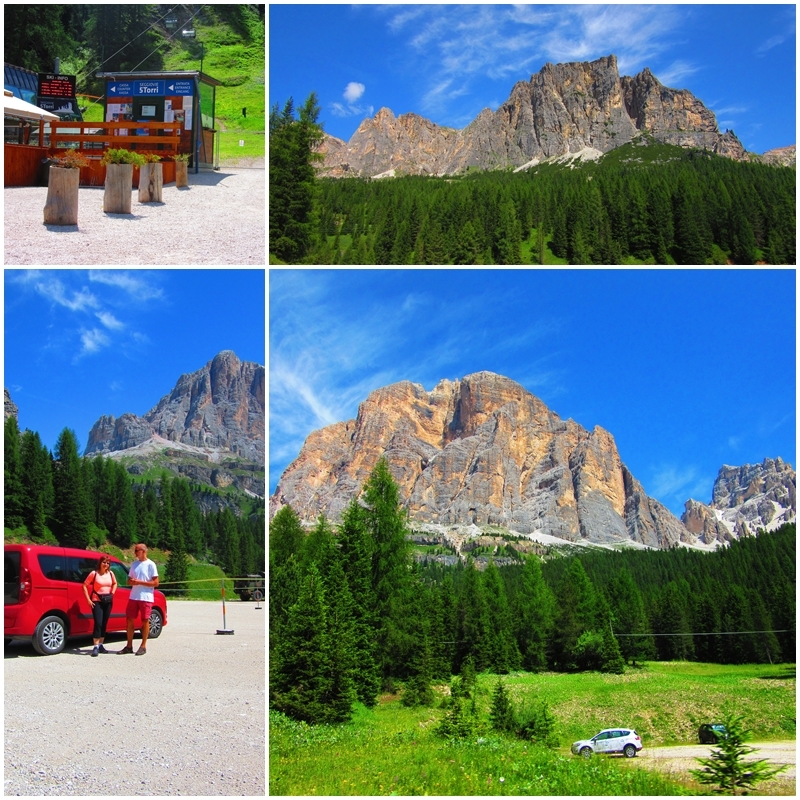 Leaving Cortina d’Ampezzo behind we made a stop at the Lagazuoi – Cinque Torri Ski Resort. As it was early July, this was an ideal stop for an ice cream with a breathtaking view of the mountains. Across the street is the Piz Cunturines, with an altitude of 3064 metres the highest mountain of the Fanes Massif in the Dolomites. 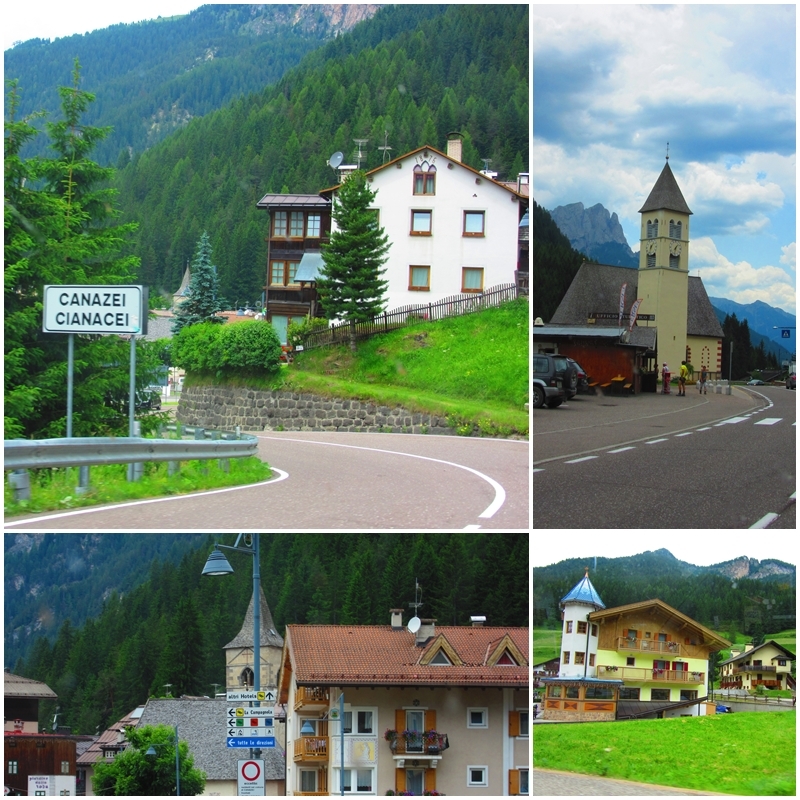 We continued our drive through the Italian Dolomites past the Passo di Falzarego and down the valley towards the village of Arabba. This small village is surrounded by the Ski Arabba ski resort. Along the way we encountered hundreds of bicyclists who were cycling up and down these impressive mountains. Although I absolutely love cycling, the altitude and steepness of these mountains certainly would be too overwhelming for me. 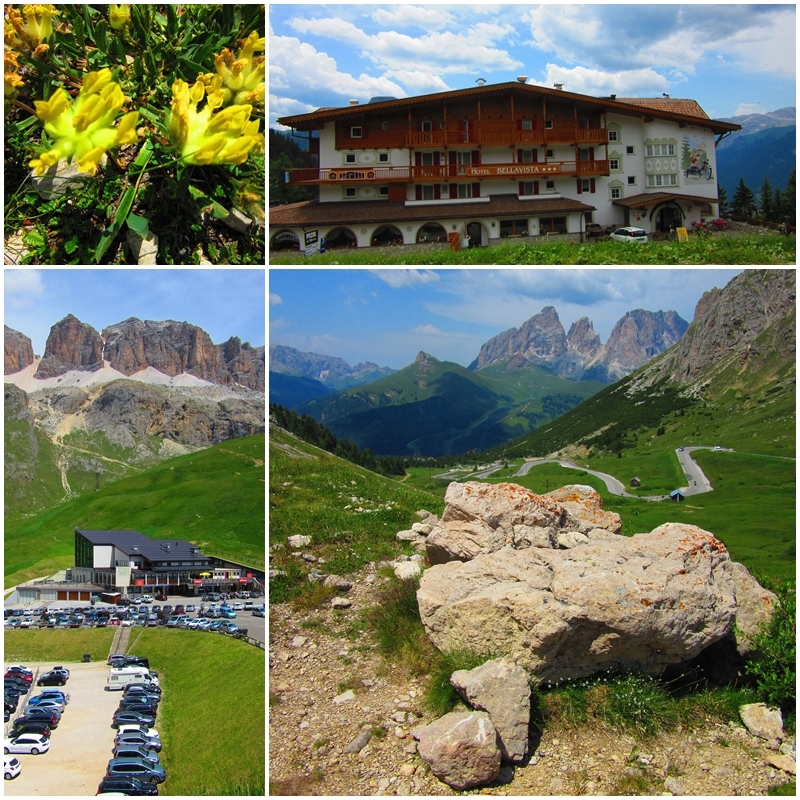 Arabba is located at the base of the Sella Massif and at the foot of the Pordoi and Campolongo Mountain Passes. 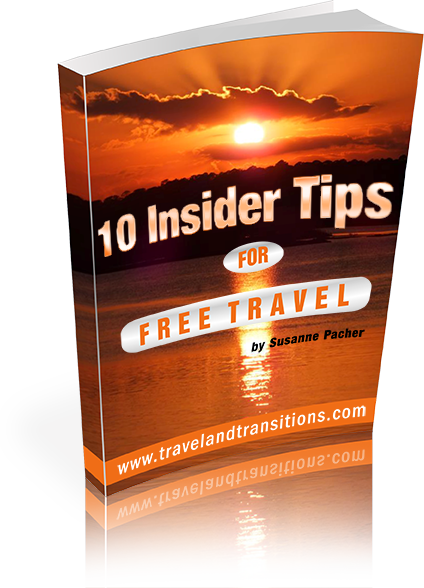 In total, this region boasts 1,040 kilometres of ski trails and 465 lifts. At an altitude of 1600 metres or 5250 feet, Arabba is also one of the highest municipalities in all of Italy. As we were driving I was busily snapping pictures of the breathtaking surrounding mountain panoramas. 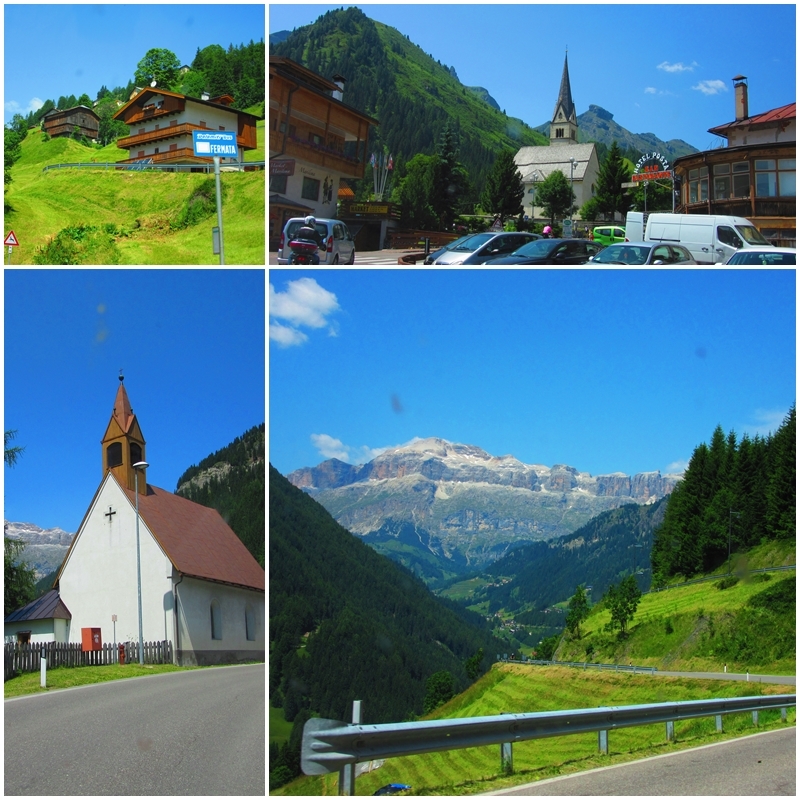 These images were taken near Arabba in the Italian Dolomites. The Hotel Ristoro Lezuo is embedded in a fantastic mountain panorama that includes the Sella Group, the Marmolada, Tofane and Antelao mountain massifs. It is located near the Pordoi Pass, a mountain pass with an altitude of 2239 metres that connects the villages of Arabba and Canazei. The mountain landscapes of the Italian Dolomites are simply among the most awe-inspiring sceneries of the world. In the early afternoon, we stopped at the Pordoi Pass to have a picnic lunch. Across from us was the bottom station of the aerial tramway that takes you up to the Sass Pordoi. This cable car covers a distance of 1600 feet and an altitude difference of 670 metres and is part of the Canazei – Passo Pordoi ski area. This area is located along the “Grande Strada delle Dolomiti”, the Great Road of the Dolomites which started to be developed for tourism around 1870 when the historic Hotel Pordoi was built. 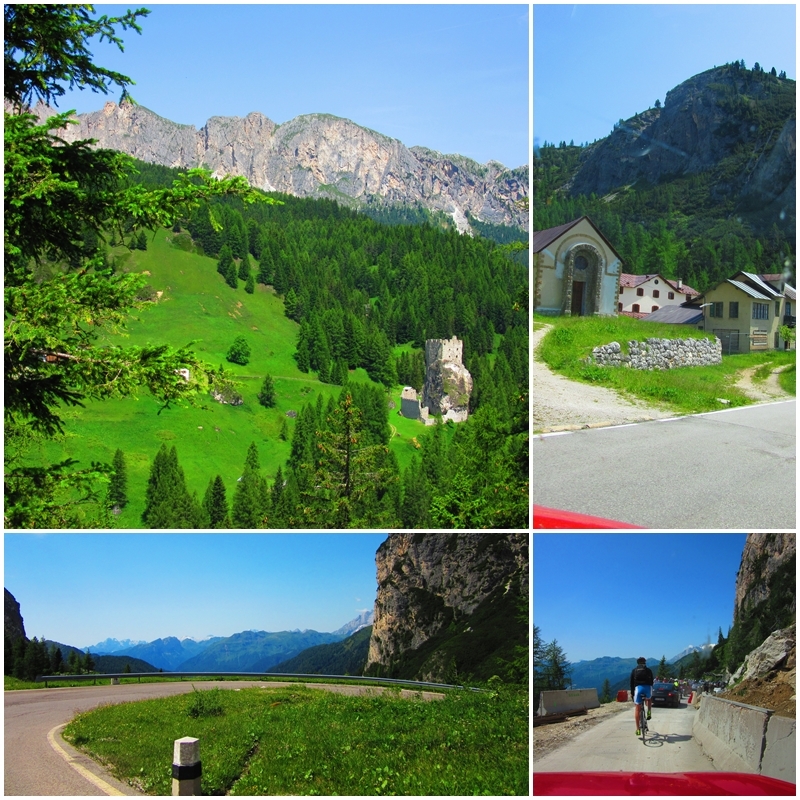 On the way down from the Pordoi Pass we drove through Canazei, a small village in South Tyrol that is the base station for hiking and rock climbing excursions in the Sella, Marmolada and Sassolunga mountain massifs. As part of the Sellaronda, you can also cross-country ski around the Sella Massif, starting in Canazei. As we started approaching Bolzano, the skies clouded over and dark storm clouds were building up. After a brilliant day full of sunshine we would definitely reach Bolzano in the rain.